The first town in New Jersey that connects that state to New York City via the George Washington Bridge is Ft. Lee. My great-grandfather was the mayor there in the early 1900s. The next town is Englewood, where I was born, and the next town is Teaneck, where I grew up. We lived in a nice, middle-class dwelling with two parents and five children — me in 1955, Patrick in 1957, Mary Ann in 1960, Kathleen in 1963, and James in 1966 — and one cocker spaniel named Sugar. We only had one and a half baths, so it was really a busy place! But we were a nice, big Catholic family who went to noon Mass every Sunday. It was a beautiful home to grow up in because it was very evident that my parents loved each other. I believe that the most important thing for children is that they are marinated in love and a loving environment. When I see so many children who are denied that very precious environment, I understand how really lucky and blessed I am. My mother was a housewife, busy raising five children and very devoted to her family. My father was a data processing manager for National Distillers and Chemical Corp. in New York City and was on the ground floor of computers. He told us back in the '60s that computers were the future. My parents taught us manners — we said grace before meals and had to ask to be excused from the dinner table — and our entire family was extremely polite to one another and to others. The great exception to this rule was the constant wrestling matches between my brother Pat and me. Boys will be boys. I loved television from the first time I watched it. We had one black-and-white TV, and you had to manually turn a knob to change channels. Television was just magical to me, so it had me in its spell early and often. By high school, I was watching television news with great interest. By ninth grade, I had plans to become a priest, so I went to the Mt. Carmel Junior Seminary for one year in Niagara Falls, Ontario. I then went back home and entered Paramus Catholic Boys' High School. Almost every evening, I'd watch WABC Channel 7 Eyewitness News. It was unbelievably well done, with an interesting team of anchors. Geraldo Rivera was a street reporter for that station, and back in the early '70s, Geraldo was phenomenally talented and broke some huge stories. I watched other newscasts, too. Channel 2 had a reporter named Frank Gardner, who would later be my boss. But there was something about the WABC newscast that attracted me. In the back of my mind, I thought, "I could do that." I was in my senior year and had been making noises about taking a year off from school or maybe joining the Navy — neither of which was sitting well with my parents. The phone rang one Sunday night at dinner when all five of us kids were sitting with our parents at the dinner table. I answered it, and on the other end was a recruiter from Christian Brothers College in Memphis. The Christian Brothers is a religious teaching order in the Catholic Church that has 56 high schools and 6 colleges around the country. They go into high schools to recruit classes of college freshmen. They had found me in Paramus. The recruiter invited me to come to Memphis to look at Christian Brothers College. I laughed, went back to the table, and announced to the family that a college in Memphis, Tennessee was interested in me. We even got out the World Book Encyclopedia to look up where Memphis was located. I said there was no way I would go to school all the way down there. But a few months later, the recruiter called back. I had yet to make concrete plans for the fall semester in 1974. My mother answered the phone. She asked him what day school started. She then said, "Brother, he'll be there." So I came to Memphis in August 1974, sight unseen, and I <<loved>> Christian Brothers College. The professors were so good that I didn't want to miss class. I was majoring in English and minoring in draft beer consumption, and it was really a charmed time to be at the school. I started writing for the school newspaper and decided I wanted to try being a reporter. My academic adviser's wife's cousin was Ed Greaney, who was the assistant general manager of WMC-TV. Frank Gardner — the reporter I used to watch in high school — was the news director. On January 28, 1978, I walked into Channel 5 and told them I wanted to be a reporter. Frank hung his head and shook it. I was probably the 10,000th college kid who had come in and made the same announcement. But Frank didn't understand how serious I was. So they let me intern there — as a gofer — and they haven't been able to get rid of me since! My big break into becoming a reporter for Channel 5 came about because of a series of incredible events in 1978. First, the firefighters went on strike. There were 250-some fires in vacant structures during that week of striking. There was more news to cover than we had reporters, so I interviewed a lot of the fire commanders. The mayor, Wyeth Chandler, came on live television and commented on interviews he’d seen with the non-striking fire command staff. Although the viewers never saw me or heard my voice, the mayor of the city was reacting to interviews I had conducted! I was addicted to the news, lock, stock, and barrel there and then. Next, the police went on strike in sympathy with the firefighters. Then a mistake at MLGW caused a blackout in the city. Later that year, the teachers went on strike. It was quite a tumultuous summer, and we were covering all kinds of things. It was a seminal summer for me, and it allowed me to prove my reporting skills. I was promoted to reporter in 1980 and launched a dream. 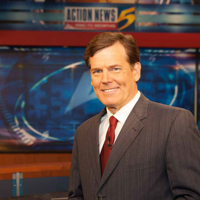 In 1982, I started substituting at the news anchor desk when an anchor went on vacation or called in sick, and in 1983, I became a full-time co-anchor of Action News 5 at 10 o’clock weeknights. It's been an incredible 34 years. When I look back on everything that has happened, it's been one remarkable journey — and it's not over yet. Growing up, television was … mesmerizing to me. I'd be watching Felix the Cat or Bugs Bunny, and my father — who was an incredible handyman — would ask, "Why don't you come with me, and I'll show you some carpentry skills?" I'd say, "No, Dad. Pepe Le Pew is about to do something really important. I have to check this out." I wish I had those carpentry skills today! My earliest interest in television began… on August 28, 1963. My father was painting the living room, and I was in the room with him. We had the TV on, and Dr. Martin Luther King Jr. was giving his "I Have a Dream" speech at the Lincoln Memorial. I watched my father move closer and closer to the television. I asked him, "Who is that?" He said, "He is a very important leader of his people." I was only eight years old, but I remember that moment. I realized the important and powerful role television plays. My first job at Channel 5 … I started interning for them in 1978 when I was a college senior. I did all kinds of behind-the-scenes gofer work. I mostly drove, toted equipment, and ran the audio. It gave me the chance to watch reporters do their thing close-up. I knew I wanted to do it, too. I was hired full time at Channel 5 … on May 28, 1978. I did basically the same work that I did as an intern: toted equipment. I made $2.35 an hour — minimum wage. Channel 5 promoted me to reporter when … Well, most people don't know what I did in 1980 to prove to Channel 5 that I could do the work of a professional reporter. The station still viewed me as just a college kid, and I knew I had to show them otherwise — even if it meant being sneaky. Back then, NBC affiliates such as WMC used something called NPS — News Programming Service — which supplied news stories from other NBC affiliates around the country. We used those affiliate stories as fillers on slow news days. So without my boss knowing, I'd tell my cameraman, "Instead of going to lunch today, let's go shoot this story, I'll sell it to NPS, and we'll each make $100." In other words, I was shooting stories that were airing on NBC affiliates in other cities, but not on Channel 5. One day, Frank Gardner, my boss and mentor, called me into his office and told me to close the door. "I hear you're on television in Little Rock. And I hear you're on television in Chicago. And New York City. And Des Moines. But you're not on television in Memphis." I explained why I did what I did. Frank said, "OK, you're a reporter. You'll make $15,000 a year, and you have to wear a suit every day." A reporter's equipment … When I first started, the equipment was bulky. We had a giant recorder and microphone, and I'd be connected via an umbilical cord to the cameraman, who wore a big battery pack. All of that has been condensed into equipment the size of a cell phone. To prepare for each broadcast … I say a little prayer — Psalm 19:14: Let the words of my mouth, and the meditation of my heart, be acceptable in your sight, o Lord, my strength and my redeemer. Then I thoroughly review all of the copy that I'm supposed to read. The first time I anchored the news … I looked very much like Albert Brooks in Broadcast News, with sweat pouring off of me and a deer-in-the-headlights look on my face! Reporter or news anchor? … I like them both a lot. The anchor desk has a lot of immediacy, and it's a talent that is honed through a lot of experience. I still produce some of my own stories, though, and enjoy reporting, too. I just can't decide which I like better. My co-anchor, Ursula Madden … We have been a team since January 2009. I've had about eight "TV wives," and she is my absolute favorite. She's very thorough and professional, yet we crack each other up on a regular basis. To keep from laughing during a broadcast … I do a thing called Comedy Alert whenever I see something in the copy that might make us giggle on the air. During the commercial before that segment, I read the humorous story out loud, and we all get the laughs out of our systems. That's how we're able to keep a straight face when reporting some of our funnier stories. I'm grateful for … I have to give so much of the credit for my success to Mason Granger, a gifted journalist who rose from the ranks of reporter to succeed Frank Gardner, and another mentor, Jim Zarchin, as news director. Mason gave me huge opportunities to cover stories important to the Midsouth. He gave me the break of a lifetime to serve as 10 o’clock news co-anchor. And he allowed me time to develop as an anchor, a process that took time, patience, and good, orderly direction. I’ll always be grateful. My biggest fear during a broadcast … is that I might inadvertently use bad language. Any time the microphone is on, I am very, very careful about the language I use. You're always afraid, too, that you might accidentally mispronounce a word as a dirty word. An interesting coincidence … I was flying from my New Jersey home to Memphis for the very first time to attend Christian Brothers College in August 1974. At the Washington D.C. stopover, Harold Ford Sr. — before he became a congressman — got on the plane and sat next to me. We struck up a conversation, and he tried to recruit me as the manager for his upcoming congressional campaign. So I ended up knowing Harold and covering him throughout his entire congressional career. My least favorite part of my job … Makeup! I dislike every part of it. But if I didn't wear makeup, I'd look white as a ghost under those lights. So I've learned how to do it, and it only takes about five minutes. I won an Emmy Award for … Our station did a nice piece on a snowstorm in 2001, and our team received an Emmy. I personally don't apply for a lot of awards, but the team included my name, and I thank them for doing that. One of my worst broadcasts … I've made so many mistakes over my career, but one of the most embarrassing gaffes was when I covered then–Gov. Ronald Reagan’s one and only visit to Memphis during his 1980 presidential campaign. I bent over to pick up our giant videotape recorder and split my pants as bad as a man can split his pants. So I covered a news conference — with the next leader of the free world — with my backside as close to the wall as possible! But I still managed to get a question in to our future president. My first paying job related to the news … When I was seven, I had a paper route — the Bergen Evening Record, now called The Record. I was too young to have a paper route, but I was a subcontractor for a kid named Tony Bale. Well, Tony shorted me on my first payday. My father went to see Mr. Bale, who brought Tony to our house, where we settled our business. My on-air wardrobe consists of … probably 20 suits and 100 ties. And yes, I rotate them. The part of the job that requires the most stamina … These days, it's a marathon of keeping myself at my best through 10:35 at night when I go off the air. I'm 57 years old now, and I have to be totally on my game when the 10 o'clock broadcast comes around. I have to be mindful to pace myself throughout the day. Meanwhile, most of my peers are watching me through their toes at that time of night! My civic involvement … I’m the vice chairman of the board of trustees of my alma mater, CBU, which is a magnificent, but often overlooked, Memphis asset. I've been honored to receive many awards for my charitable endeavors, and every recognition means a great deal to me. But the true joy for me is being blessed in a position where I can be involved in so many worthwhile organizations in Memphis: Ave Maria Home, Diversity Memphis, St. Peter Villa, MIFA, St. Jude Children's Research Hospital, Alzheimer's Association, and others. One civic endeavor close to my heart … is the Gibson Guitar/Baldwin Piano 5K Run-Walk for St. Patrick Learning Center, which serves families in the city's poorest ZIP code. I co-founded the race in 1996 with two priests at St. Patrick Catholic Church — Father Gil Martinez and Father Paul Dechant — and I have thoroughly enjoyed being the race director all these years. When I met Pope John Paul II … my heart was pounding. My cameraman captured the moment where I said, “Holy Father, the people of Memphis send you their warmest greetings.” In his Polish accent, John Paul II said, “God-a-bless-Tennessee.” I thought the Pope was pretty sharp to know the state where Memphis is located! My greatest extravagance … I have an absurd number of running shoes! From my mother, I got … perseverance. She taught us to stand up for ourselves, to be respectful of ourselves and others, and to make sure we were paid appropriately for any jobs we did. My father taught me … integrity. He also taught us prayer, discipline, and athletics. He was a track star, and when I was a teenager, he and I would race each other on the beach. I never beat him. My name … I'm named after my father, Joseph Francis Birch. My grandmother — after having two daughters — prayed to Saint Joseph, Saint Francis, and Saint Anthony that she might have a son. When she did, she named him after the first two saints. At my father's confirmation, he took the name of the third saint, Anthony. People might be surprised to learn … that I was desperately shy when I was young. Theater in high school helped. TV news has been a test for me to continue overcoming that shyness. Now, you'd never guess it! I met my wife … at Christian Brothers College. Robyn and I danced at the Riverboat Dance on Memphis Queen in 1977, and we married June 25, 1983. Joseph III is a second-year law student at the University of Memphis Cecil C. Humphreys School of Law, and Matthew is a junior at Christian Brothers University. Items still on my bucket list … I want to see the aurora borealis, travel to the Holy Land, see Italy and Europe, and learn another language, for starters. My final 2 cents … Memphis has been a great blessing in my life. It’s provided me with an education, a loving family, and an incredible career. It has been Graceland, indeed! It’s easy to become discouraged about the challenges our city faces. But I choose to love Memphis and aspire to serve our community so that more and more of us fall in love with this city that has embraced a Jersey boy so completely!